When you're running an animal shelter, names are probably the least of your worries. But you've got to call the little guys something, right? 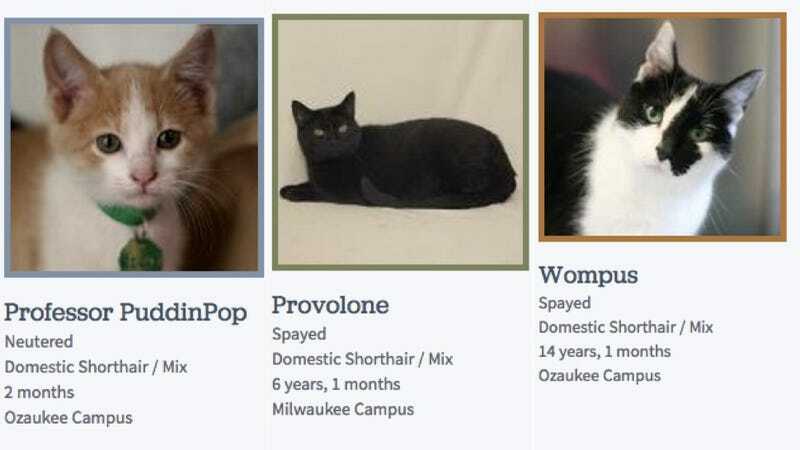 Well, somebody at the Wisconsin Humane Society has quite a talent in this particular arena. Yes I will take them all, thank you! Such forethought, naming them things I will end up calling them, anyway. (For a long time my cat, who has a real name, went by "Fuzzbuzz" when I greeted him upon arriving at home.) Additional winners include Lester, Zena, Vespa, Mighty Mouse and Waldorf. Oh and, for some reason, Adrien Brody. Unfortunately there are, as yet, no photo available for Adrien. Nor is it just the cats! It's almost enough for me to reconsider my firmly held conviction that human names are the best names for cats. "Tom," say, is pretty good, but this makes me think, "Mister Tom T. Bombadil Attorney at Law" would be better.